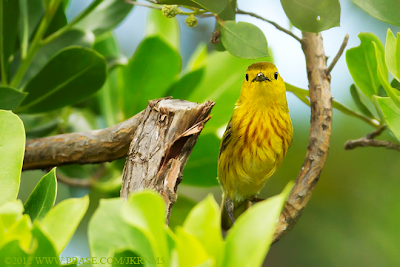 Cuban Golden Yellow Warbler by Bob Pelkey at Card Sound Toll. The pelagic trip sponsored by Michael Brothers and the Marine Science Center in Ponce Inlet was a long awaited activity for this holiday weekend. I was looking forward to seeing several new birds. Such as black-capped petrol and arctic tern. But Tropical Storm Beryl changed our plans. As Bob Pelkey, Lee County's Master Birder - Vince McGrath, Dr Jose Padilla Lopez and I were traveling across the state to attend the trip we received the, actually expected, news that the trip had to be cancelled. So what do we do know. We formulated Plan B. Lets head to the Keys. So we changed course and headed south. At a quick stop along Rt 70 in Okeechobee County we picked up Black-bellied Whistling Duck, Limpkin, Barn Swallow, Osprey, White-eyed Vireo, American Crow and American Coot. Other sightings included Crested Caracara, Red-shouldered Hawk, Sandhill Cranes, Swallow-tailed Kites, Cattle Egrets, Eastern Meadowlark and White-winged Doves. After many miles we tryed the 800 Building on Old Griffin Road for the smooth-billed ani. There have been a few reports of sighting here recently, but these guys seem to be becoming much harder to find. After dipping on the ani we checked out the Cave Swallow colony in Cutler Ridge. Found a couple of dozen cave swallows zipping around the bridge they called home. After Lunch in Florida City, were we picked up Common Myna, we headed to the Keys by way of Card Sound Road. At the toll booth we parked to search for the Cuban Golden Yellow Warbler, an East Indian subspecies of yellow Warbler, only found in the the U.S. in the mangroves of the Florida Keys. After spending time in the locating and photography of a pair of Black-whiskered Vireos, we did succeed with Cuban Golden Yellow Warbler. We also saw our first of the day Magnificent Frigetbird, our first of the day White-crowned Pigeon and singing Prairie Warblers. 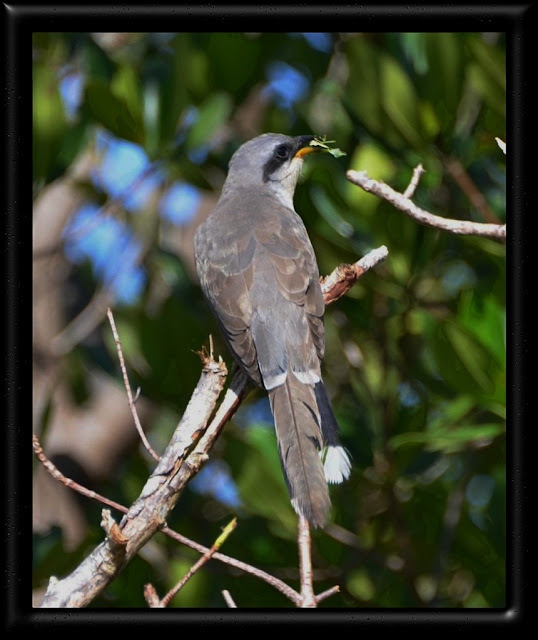 On Key Largo the sightings of Gray Kingbirds, White-crowned Pigeons, Eurasian Collered Doves and Mourning Dove were numerous. We stopped at Dangy State Park, were we easily found more Black-whiskered Vireos, White-eyed Vireos and a pair of Mangrove Cuckoos. By six o'clock we had made it to the government building in Marathon we encountered dozens of White-crowned Pigeons. The target of the nesting Roseate Terns were harder to locate. After some time a pair was seen, including one who was very active in harassing one of the many Least Terns that were also nesting on the roof top. The last target of the day were the Antillean Nighthawks, that are found at the Marathon Airport. We found a pair cavorting with each other at the western end of the run way. Also on hand was a lone Killdeer and several Cattle Egrets. Because we had made a last minute decision to come to the Keys on a holiday weekend, there wasn't a room to be had. So we retreated to Homestead for accommodations to prepare for day two. Our first stop of the day was the quite and beautiful campus of the University of Miami. Many exotics are to be found here and we did have some sucess. We began with a pair of White-winged Parrots and was able to add a noisy pair of Common Hill Mynas, followed by a pair of Spot-breasted Orioles and a Chestnut-fronted Macaw. Awesome. I have dipped on all of these species in the past. Other species seen here included Chimney Swifts, Green Heron, Downy Woodpecker, Fish Crows, Blue Jays and House Sparrows. At the Kendell Baptist Hospital campus we added the ever present Mitre Parrots and a suprise Cockatiel. At the pond we found Muscovy Ducks, a family of Egyptian Geese, a Swan Goose, White Ibis and Boat-tailed Grackles. It was sad to see a Fish Crow fly-in with the body of a duckling which it began to consume. Following a great lunch at a Cuban resturant, we headed for home. Did stop along Turner River Road in Big Cypress National Preserve with the idea of maybe sighting white-tailed kite. No today but we did add a Least Bittern, Great Blue Heron, Red-shouldered Hawk, a Pileated Woodpecker, Northern Bobwhite, an Eastern Bluebird, Great Crested Flycatcher, an Anhinga, Eastern Towhee, Common Nighthawk and Red-winged Blackbirds. To quote Vince "Not bad for plan B"
Headed over to Ding Darling Wildlife Refuge on Sanibel Island in hopes of locating a mangrove cuckoo. The high tides really reduced the shore birds and waders. Did find a single Willet, a pair of Mottles Ducks, fifteen Roseate Spoonbills and a few waders. Did luck out with locating a calling Black-whiskered Vireo and a White-eyed Vireo at the crossover dike. A couple of years age I had success at this spot with spotting a couple of mangrove cuckoos. But today I did not hear or see any here or at other likely spots. My daughter, Katie and I headed over to Six-mile Cypress Preserve to see if any late migrants were about. We first stopped at the pond at Metro Parkway to see if any white pelicans were on-hand. Just the day before Bob Pelkey along with several fellow photographers rescued a hurt pelican here. It was taken to C.R.O.W. on Sanibel for treatment of its broken wing. We didn't see any pelicans today, but did find a couple of Black-necked Stilts, Least Sandpipers, Killdeers among the usual waders. At Six-mile it was very quite. We were rewarded with sighting the resident Eastern Screech Owl sticking its head out of the nest box in the parking lot. The other good sightings was refinding the Great White Heron at Gator Pond, that I had reported on in a earlier posting. A feww other birds seen included Tufted Titmice, Northern Cardinals and Roseate Spoonbills. Made a quick stop at Bunche Beach this morning and arrived at a high tide. Not too birdy, but some that were there were in fine breeding plumage. Spotted this bird at the lake at Six-Mile Cypress Preserve. Even though my camera is not functioning well, I believe I have was able to capture a good enough photo of this Great White Heron. They are not common in our area, but can be more numerous further south around the Keys. Walked two loops around the boardwalk looking for any migrants. Did have some success with sighting a Cape May Warbler and a Blackpoll Warbler. Other warblers included Black-and White, Common Yellowthroat, Prairie and several American Redstarts. Another migrant found was a Swainsen's Thrush. Other birds included an uncommon to Six-mile Limpkin plus Blue-gray Gnatcatchers, DB Cormorants, Anhingas, Carolina Wrens, Northern Cardinals, Red-shouldered Hawks, a calling Barred Owl, several Tufted Titmice, Pileated Woodpecker, Hairy Woodpeckers, Downy Woodpeckers, and several Red-bellied Woodpeckers.